I once had my Soviet T-72 company behind walls and buildings, except for one tank near a gate. My buddy's nasty W. Germans could trace 1 or 2 lines of site thru the gap and Bam, no cover for the whole company! I did get even later, but I would have to agree: Gamey. Where would you get 6 x Mi-24s to support just a handful of tanks on the tabletop too? People seem to like it, as a "game", but it really bears very little resemblance to what a real, Cold War, armored battle would look like, I suspect. Still, who doesn't love great-looking, modern vehicles and troops on the tabletop, battling it out for supremacy of the battlefield? What would you recommend as an alternate system for models already based for the game? Fistful of TOWs III is a great system. Gamey? Who you calling gamey? I prefer Saber Squadron as my go to small unit action rules. For an historically accurate Cold War tabletop game, the units should mostly be in barracks. Decent chance of rolling your vehicle off the road when returning drunk from a bar, though. it plays/looks much better in micro armor scale. And don't forget the "Panzer Parking Lot!" Yes. Definately. If you like dice games with pretty models, fine. Personally I don't see it as any more 'realistic' than AK-47 ….. I use the TY models for IABSM/TW&T. One of these days, I'll compile all these notes into a PDF if people are interested in Cold War wargaming with Too Fat Lardies rules. I'd be keen to see your notes on cold war gaming using TFL's IABSM/TW&T rules please Achtung Minen. Doesn't look like Rich and co are looking at getting IABNM out the door anytime soon so anything you have is appreciated. It's an off shoot of FoW which is an offshoot of the 40K model of gaming, so no surprise that it's gamey / competitive in focus. That's probably why it's popular. Cold War Commander & Modern Spearhead are good game systems, better than FOW/TY IMHO. For the record I am not a TY player and I have not played FOW since 1st edition. I cannot stand tank parking lots, although they are even closer together than in a motor pool! But, I remember playing FOW 1st edition and thinking the fundamentals were there, at least for infantry combat. Suppress your opponent with mortars and machine guns and then attack, preferable from a flank so you don't mask your support weapon fire worked pretty well. Some parts felt wrong to me, like a company commander getting direct close air support in WW2. But the rules themselves seemed pretty good. I think the "Gamey" ness is more a function of competition play than the rules themselves. Horses for courses, people playing in tournaments look like they are having a good time. I prefer much more low key. Not too gamey at all in my opinion. It is what players want. Many new games have giving the players what they want as the major criterion . To quote Abe "people who like this sort of thing , will find this the sort of think they like". The reason for my comment was that because of the way casualties are taken from any unit of a platoon there is no incentive to use tactics within the platoon, you just take off whichever part is least critical, not the stands which have actually been hit. 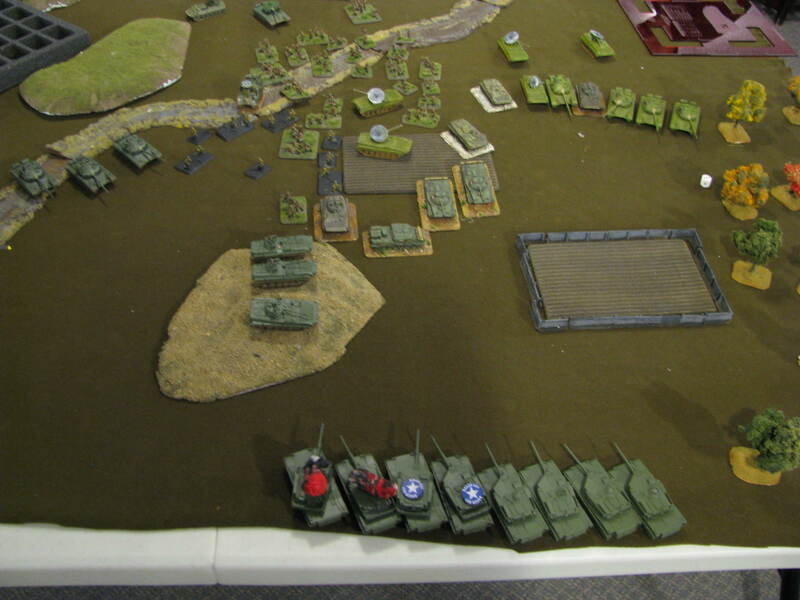 I have also seen far too many games with what should be fragile and valuable anti aircraft units leading tanks chasing helicopters around tables, instead of staying hidden, and players parking units on objectives in unsustainable positions as they know the game will end next turn. I have played the rules several times but they are not for me. IABSM/TW&T is definitely the way to go! People complain about the wall of tanks but most games have nothing penalizing it. Weasel it is because most folks dont want to model certain things. Specifically we all want artillery in our games but most people dont want it to be as damaging as it really can be. If more games let indirect take tanks out of the game they would not make such big wonderful targets out of them. Also, as you know fromm the suppresion thread, formations are important for 360 situation awareness. This is even more important for vehicles than grunts. And gamers know they are in an even point game, so not to many surprises. RW tanks have no such knowledge, so you stay dspersed so at least some of you can respond to most anythng. random explosive crap falling out of the sky on you will make real people spread out. plastic model dont care as much. Yes, it is all gamey because that is what our hobby/activity is and has been all about. I can recall playing a Napoleonic wargame with firesticks and a gamer who used flats to cut down on casualties from the touching of the firesticks to the figures. This in 1974. But it is a game not a simulation and certainly not going to be used at Bovington or Warminster as a training system! In addition to many of the points, using div level arty in direct support of a small battlegroup, is a little odd for the period. We never saw BM-21 or 2S3 being used or training in that aspect! In TW&T, for instance, the main punishment for wall to wall tanks is that 1) it is much easier to range in on them all in one go and 2) there is no advantage to wall to wall tanks. Activation is card based and so you don't get to fire all your tanks off all at once like a great Napoleonic volley of musket-fire. Lining up all your tanks together is just making what one might call a "target rich environment," nothing more. It's kind of sad, but people don't want to play simulations anymore. I remember in the 70's and 80's it was Combat Commander, Empire, Mustangs and Messerschmitts. People no longer have the attention span or patience. Having said that, there are some really good fast play games that aren't that gamey. The problem is, the more modern era you play, the dumber the game looks when you insert heavy doses of gamey. You get less models on the table. Credible battle plans like chess take thought, time as and effort. None of which seem in vogue at the moment. I did enough credible battle plans and simulations when I was a Marine, I'm perfectly content with a game these days. I played TY twice, and the Russian player charged me from out of sight, firing as he went (some special Russian rule), slaughtering the squad before they could even shoot at him. I suspect we didn't play the rule right, it seems to me you would have to have the enemy in line of sight before you can charge them, but if that's legal I'm not sure you even need an enemy. "I played TY twice, and the Russian player charged me from out of sight, firing as he went (some special Russian rule), slaughtering the squad before they could even shoot at him"
I played a chap who tried a similar tactic, speeding his tanks over a hill to attack the chaps on the other side. (Now if we paused in such a situation the sprog would be sent to to top of the hill to stag on and watch for any enemy). The rules I was introducing him to allowed for overwatch/interdiction fire which simulates this. Needless to say none of his tanks survived breaching the skyline. I'm hoping that Pendraken put out the revised Cold War Commander set sometime soon. It was fun to play and did make you think. I've had gameyness problems with all sorts of rules so it's not a specific FOW problem. In my experience it depends very much on the players and how much they want to exploit loopholes (or just be a d***). My rules use oil-fashioned burst circles (old CDs work nicely for 20mm): anything inside is hit. It's a simple but effective way of keeping a sensible distance between the toys without resorting to legalese. It is not about lack of attention. It is about what real combat is, and regarding 20th century combat, air, land sea, about the lack of miniatures on the table in a game that is closer to a simulation. Ask any cobat vet if his vision of the battlefield is as clear as what we have in say Check Your Six or General Quarters or Command Decision. The other guys stuff simply isnt there. There is no "crutch", that is, the other guys ships over the horizon or planes in the clouds or troops behind heavy concealment on the table over the horizon, in the clouds, in concealment, the crutch being there for at least three reasons. The hobby is about the miniatures, so display them for the photos. The gamers do not like umpires or ambushes, or unequal battles, they prefer chess. And it is a game as the hobbyist cannot get the uniforms right as Elting points out that theres what the regulations say they wore, what the artists draw or paint and what they actually wore, and the traditional gamer goes for the regulations, as one example. 25 years ago we designed our own rules. Had a guy playing Soviets mass a ITB in the open to assault dug in W.Germans. totally ignoring the US scout section. A turn later the ITB lay smashed and burning from a US 155mm btry firing DPICM. Last time we had a tank park on the board. In the Soviet commanders defense, it was his first modern game. He had only played WW2 before that. We play 6mm. Going to try TY rules in 6mm. 1)getting lots of cool "Toys on Table" and 2)'Lets see how many games we can get done in one night". I can appreciate those that get only that one day a wk, or for some its maybe just one night a month to game, so they would want to play as many games as possible. For myself.. the hobby is about gaming WITH friends. Yes, I want the game to be fun and keep moving, not bogged down w/ tons of charts, rules & etc. but Im there to 'relax' and have fun. Not be put on a time schedule. I agree w/ the 'tank parking lot" comments. With 1/100 – 15mm, it doesnt take much too fill up even a 4x8, thats 32 sqr. feet of game table. While not my scale of choice, I think TY was 'made' for 285 scale. It just 'looks' more realistic space/area wise for the game. After all, realistically, no matter how great the models look, and TY has some of the best Ive seen, what are the chances that a SP Art. Btty. is going to be 'on table'? (i.e. even close to the front line action). Few businesses have even gone broke "Giving people what they want". Common sense, logic and "would this be realistic?" take a back seat, at best when it comes to sales. "SP Art. Bty. is going to be 'on table'?" Abbot crews trained firing over open sights and 2S1 could augment the Advance Guard of the Sovs, so possible. Div Arty, 2S3, BM21 unlikely and as for the odd 3 BM21 appearing in support of a TY sized Battlegroup, only in Hollywood! I even hear that SA8 may appear on the TY battlefield! However tis a game not a training simulation. In general, if we talk about real life, then 2c1 and 2c3 could accurately lead a direct fire. Moreover, they have ammunition for such a case armor-piercing shells (5 pieces, as far as I remember). Well, in the game, in principle, you can put on the table and tactical missile. And when all of your force is box canyoned in one corner of the table at the start and you're the attacker,and not much room to manuever into a better position….oy!